Lovely brown White Wallis polka dot dress. Lovely lightweight dress. it is unlined, very pretty feminine dress which can be worn to parties or weddings etc. IVE LOST THE SASH ( so no belt) BUT A BROWN, WHITE OR NATURAL LEATHER BELT WOULD LOOK NICE WITH THIS. Womens size 16 Wallis summer dress shift lined red cream white black geometric Pit to pit 21" pit to hem 27" Zips at back 2 front pockets VGC. Condition is Used. Dispatched with Royal Mail 2nd Class. In a lovely stretch fabric in cream with a gorgeous bold floral design in black, orange and raspberry. Size 18 petite. Lovely long flowing skirt. Plain black at the shoulders. 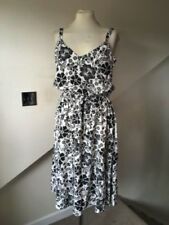 Wallis Ladies Size 18 Summer Boho Maxi Dress, Stretch Material. Gorgeous print and very comfortable to wear, drapes beautifully. straps wide enough to cover bra straps or it’s comfy to wear without too. Ties to bust to gather for coverage preference Condition is Used. Very slight snag on lower back but barely visible. See photos, photo 8is zoomed right in to show snag, photo 9 is pulled away to show it as it looks in normal use. I didn’t know it was there until I examined closely! Dispatched with Royal Mail 1st Class. WALLIS SIZE 16 BEAUTIFUL BLACK WHITE SPOTTY VINTAGE 50'S STYLE FLIPPY BELT DRESS. Lovely hardly worn Condition . Dispatched with Royal Mail 2nd Class. Soft smooth knit in 83% viscose,15% polyamide, 4% elastane. Wallis Size 14 linen and viscose sleeveless dress. Condition is Used. Dispatched with Royal Mail 2nd Class. Wallis lovely orange print shift dress. LOVELY QUALITY DRESS FROM 'WALLIS'. SHORT SLEEVES WITH TIE. PERFECT FOR SMART OR OCCASION WEAR. This is such a beautiful Wallis dress in a size 14 petite. The dress is a pretty multicoloured coral, green, pink and yellow tropical floral print all over. Gorgeous viscose/Elastane fabric which is really smooth and stretchy. Pretty dress with stretch in vgc. A LOVELY LADIES SLEEVELESS, STRAPPY, KNEE LENGTH SUNDRESS IN RED/WHITE/BLACK WITH BOAT NECK, CONCEALED BACK ZIP FASTENING AND BEAUTIFUL SQUIGGLE PATTERN. Colour/design: Black and white polka dot design. Length (from shoulder to hem) : 44". Bust Size (approx) : 42 ". Bust - 19" Across the Front (underarm to underarm). Length -60" shoulder to Hem. 100% viscose. Orange/ purple / black / cream /green. Slip over, elastic banded waistline. 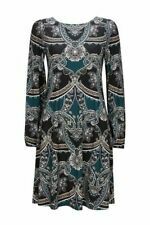 Gorgeous Dress size 18 100% Viscose floral coloured excellent condition. Black White Floral f it&flare Dress. Lightweight Viscose fabric. 1 9” across waist. 1 7” shoulder to waist. 2 2” armpit to armpit. Stunning wallis purple bird dress. A gorgeous dress from Wallis! A purple with white black, gold bird and flower patterns - really is beautiful. No belt with this dress - a thin black or brown one would go nicely. Size 14 Petite. v cross over bustline, tie belt to back. Teal/Pink Print. length from top of shoulder to hemline: 50". armpit to armpit: 18". THIS SALE IS FOR A SIZE 16 - WALLIS DRESS. GOOD CONDITION. FULLY LINED. LENGTH FROM NAPE OF NECK TO HEM IS APPROX 43". Wallis Size 12 Dress Leopard Print. Condition is Used. Beautiful dress, really flattering on the body. Can be worn for any occasion eg work, day, night, wedding or party. Gorgeous print and comfortable material. Small fault that the buckle on the dress needs to be down back on, but easily done. Dispatched with Royal Mail 2nd Class. Size 14 Petite. Green Multi Floral Print. armpit to armpit: 17". length from top of shoulder to hemline: 35". pull on style. Wallis dress size 14. Condition is Used, but as new. Length from shoulder to hem 40ins. Flared skirt. Lovely material. Pleated on kneck line. Belt round waist. Dispatched with Royal Mail 1st Class. 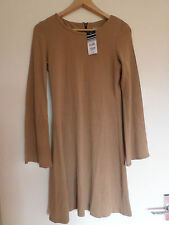 wallis dress size 16 used. Condition is Used. Dispatched with Royal Mail 2nd Class. This is a gorgeous dress from Wallis. A black viscose with white polka-dots, in a knee-length tea dress. Flattering neckline, sleeveless and with buckle waist trim. Back zip and with fit and flare shape. Wallis lovely print maxi dress, flattering bust detail. Wallis maxi dress 14. half elastic waist at back excellent condition Please see other items Dispatched with Royal Mail 2nd Class. This auction is for a Wallis Tunic Dress Black Orange Floral Print Shift Summer Sleeveless Size 14. It has been well washed and worn but is in good condition although it has some thinning in the fabric on the back(see pic). The measurements are 20” pit to pit and 37” shoulder to hem. Please feel free to email me with any questions. Colour/design: White with abstract blotted city pattern. Bust Size (approx) : 44 - 50 ". Length (from shoulder to hem) : 42". Dress has stretchy underskirt. originally RRP £40. With the lovely contrast of being edged in black this nice blue/turquoise WALLIS dress is a size 14. 21" from armpit to armpit un-stretched and approx. 36" in total length. Very good used all over condition and top quality as you would expect from Wallis.